Spring Hill Inn offers serenity with style. 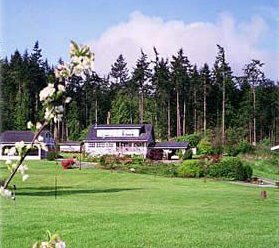 Whidbey Island is one of the Northwest's great beauty spots, and Spring Hill is an excellent choice for your stay. We're close to both the Clinton and Keystone ferry docks and right between the two popular waterside towns of Langley and Coupeville; out in the beautiful countryside on over five park-like acres. Elegant, professionally designed cottage rooms (one with kitchen), robes and hairdryers provided. Marvelous full breakfasts in the Inn. No children or pets. Enjoy badminton, horseshoes, ping pong and wildlife. Whidbey Island, close to Seattle but a world away, offers splendid scenery, excellent shopping and restaurants, beaches, walks, golf, fishing, etc., and can be driven on/off at its north end. It makes for a wonderful circle trip when combined with the Olympic Peninsula, San Juan Islands and other destinations.